In 2017 E-commerce retailers have witnessed 16.2% increase in sales compared to the year 2016 as per US Department of Census. The increase clearly indicated the huge demand. E-commerce giants like Amazon have already started taking measures to address this demand. For E-commerce startups, small to mid-size online stores and retailers it’s time to carefully evaluate their current E-commerce platform. Replatforming is not a proactive practice or planned by E-commerce owners, marketer, entrepreneur or Fortune 500 CEO. Most often, there’s a various driving issue that forces a company for E-commerce platform migration. 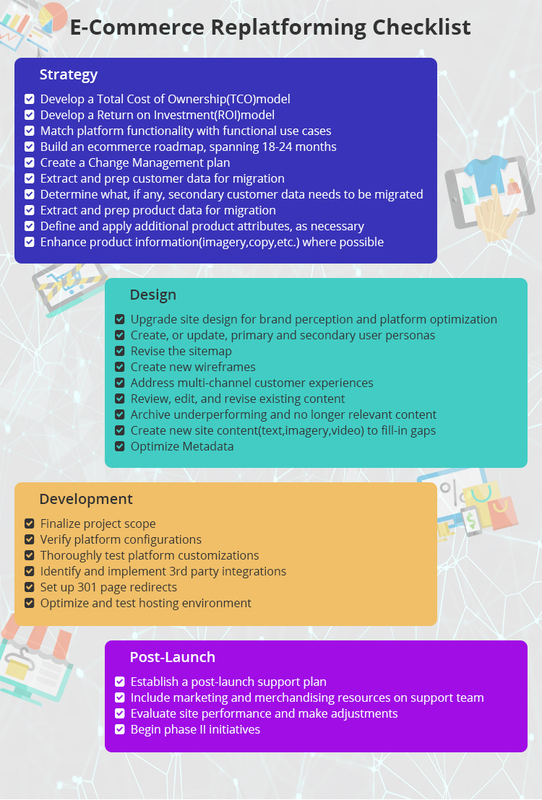 If your E-commerce platform is cumbersome, expensive and required hours of extra work, internal talking or often outsourcing to platform experts for changes, tweaks and amendments then now it’s time to migrate your E-commerce website to other futuristic, easy to maintain and inexpensive one. Reduced Operational Costs: Agreed, E-commerce migrating is costly, both in terms of time and finances. The costs are predictable, but after some time costs pay for themselves with an increased ROI. Consider responsive design: the one-size-fits-all method is really cheaper to execute in the long run. You can also reduce cost in hosting when migrating by optimizing them with web accelerators Varnish Cache or Memcache. A door to opportunities:/ With the plethora of platform out there, Often mergers & acquisition activity open a door of opportunity for companies to merge their operations and get the efficiencies of moving to combined or a new E-commerce platform. Cost-effective solution for new launching: New concept arises such as launching new product lines, new brands into markets. Through the new launches, many brands will design more cost-effective solutions in order to prove out concept. Usually, the more cost-effective platforms break the legacy platform the main brand is using and thus a migration is encouraged. Scalability: Scalability is a vital aspect to consider while migrating from the E-commerce store. 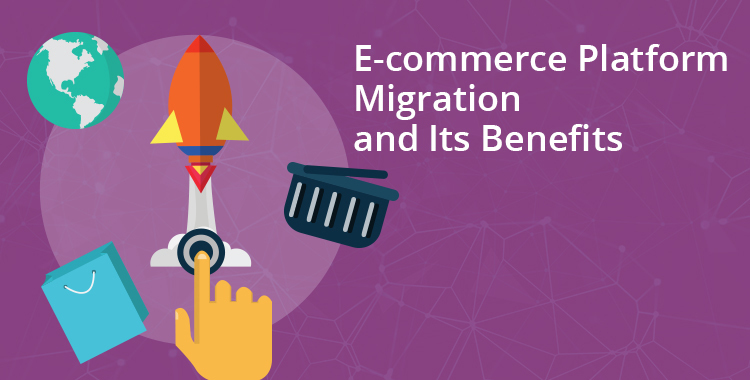 Migrating to a faster platform allows the E-commerce store to optimize the load time, help the traffic in the web page in peak hours as well as increasing site up-time. Cross-channel integration: One of the key features that E-commerce stores must check out while migration is the cross-channel integration ability. With well-organized cross-channel integration, sellers provide customers across numerous form factors whereas in-store or online, thus bridging the gap between online and offline. The choice to add the plug-ins of a range of social media platform offers the retailer chooses to send the promotional discounts with various social media platform which in turn boost the customer base and loyalty. Seamless backend integration: Bearing in mind E-commerce platform migration, it is essential that the back-end module of the E-commerce works smoothly. For this, the mapping process for the migration should be done very cautiously so that the customers don’t have to experience any issues during the transaction. Also, sellers can experience competent inventory management, updated fulfillment services, and real-time analytics as main benefits. Enhanced user experiences: The key to success for any E-commerce vendor is to offer the customers a good user experience. To deliver a satisfying user experience the recently migrated E-commerce platform deliver contents that are appropriate, sophisticated search functionality and simplified checkout process. Therefore, offering the users with a comfortable and smoother experience. Improved Site Search: As your business nurtures, you’ll want to stay in control of its several features as possible to see if everything is performing as estimated. Analytics of these vital performance displays—e.g., bounce rates, conversion rates search engine optimization—might not be available on your existing platform, which makes migration a must. Personalization: One of the key attributes to watch while vendors are thinking of E-commerce platform migration is to offer the 1:1 personalization. To discriminate their services from that of their rivals, the vendor provides personalization at the individual level. What was once a nice to have attributes is slowly becoming the consent. Mobile Commerce: With the share of mobile Commerce communication being as high as 30%, vendors just can’t ignore mobile. For the late adopters, migrating to a new E-Commerce platform is the best approach to launch a responsive design and start driving more returns from mobile shoppers. Social Media: Time and again, we’ve highlights the role of social media in the victory of an e-commerce store. It’s where the people are, it’s what they do—so you’re E-commerce store had a better strike that active market successfully. Tag Management: Tagging content in reviews, picture uploads and social posts that offer social proof and increase sales are becoming more popular online. Your new e-commerce platform provides you a feature of re-tagging to easily integrate user-generated content in real time to categories and product pages. Doing this will helpful for shoppers to have trust in brand and can boost conversions by 10%. Modern merchandising techniques: Online merchandising is advancing rapidly with the increasing competition across every E-commerce vertical. Everywhere sellers are pushing each other to deliver better shopping experience. This is great for customers, but if you don’t step your game up, your business may have to suffer. Content, video, and personalization are growing trends within E-commerce and if you’re not using these tools to help push customers through the buyer’s journey, you might not beat the competition. Increase reliability and speed: It’s every seller’s worse nightmare to have their website go down on Cyber Monday. It’s the busiest sales day of the year for many E-Commerce sellers, however year after year we hear horror stories of websites going down. Migrating to an E-Commerce platform with better hosting functionalities can assist reduce this issue. Even load times can make a major impact on sales. With plethora options out there, consumers will leave your site if your product pages aren’t loading fast enough. Enhance business agility and speed: Are you incorporating all your business systems into one platform? Working with an E-Commerce platform that doesn’t incorporate your ERP, warehousing, and marketing systems are very inefficient. You may be receiving away with it currently, but it will catch up to you in the long run. After all of this is said and done, you may think that you’re done with the process and the migration is complete. But the hard work yet just has begun. Below is the checklist offers a framework for you to make sure you don’t forget any details and have a successful migration. E-commerce store migrates about every three to four years and according to a recent survey, over half of E-commerce operators queried plan to migrate this year. What makes them migrate? Whether you are considering migrating with your current service partner or choosing a more modern services partner make sure you don’t sign a contract until you have this information. If you are passed off to partner, talk to that partner immediately. Get a solid understanding of how the catalog transfer or data migration will be done and similar stores they have already transferred, ideally from the same platform you are on. Reach out to E-commerce service providers that provide this service with an in-house team of developers and platform experts. To conclude, migrating is a huge task with many different points to consider. A successful migration can heavily depend on the quality of your selection process. Hopefully, these tips helped reframe how you think about migrating and set you up for success. Author Bio: Kristy Davis is a Marketing Manager at i-Verve Inc, an innovative Magento Development Company for web and mobile platforms. She is responsible for communication, marketing and business development of the company. Apart from the responsibility of strategic business development, she looks after branding, media relations, and advertising. Kristy also directs and manages sponsorships, marketing training, and events in the company. She has been involved in various high profile roles in the marketing industry. When she is not making any magic at her desk, you’re likely to find her exploring nature, eating her way through Lakeview, and Wrigleyville's finest cuisine and its surrounding suburbs or taking a drive along the Western Avenue. Her camera rarely leaves her side.